1st RULE: You do not talk about WRITE CLUB. 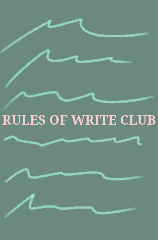 2nd RULE: You DO NOT talk ABOUT WRITE CLUB! 3rd RULE: If Marcel says "time up" then writing is over. 4th RULE: Everyone writes at the same time. 5th RULE: One poet recites at a time. 6th RULE: No dress code, come as you are. 7th RULE: Prompts will go as long as 20 minutes. 8th RULE: If this is your first time at WRITE CLUB, you HAVE to write!